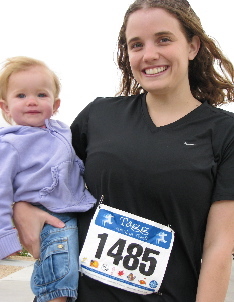 I postponed my FitMama Friday column until today because today was the day of my first ever 5K. If you are a regular reader here at Metropolitan Mama, you know that I’ve been training for a 5K using Health Magazine’s Girls Gotta Move Plan…and it prepared me well. I ran in my first 5K (that’s 3.1 miles) this morning in 60 degree weather (perfect!) alongside my husband with our Little Beauty in the jogging stroller. I am thrilled to announce that I ran the whole way, with an ending time of 32 minutes and 59 seconds (I ran just under an eleven-minute-mile). It was a wonderful, exhilarating run. I absolutely loved the commotion, the change of scenery along the “trail,” and the cheers from our friends as we ran toward the finish line. Last night, my husband asked what my next goal will be now that I’ve successfully conquered the 5K. Maybe I’ll go for a 10K, but my immediate goal is to improve my speed on the 5K. 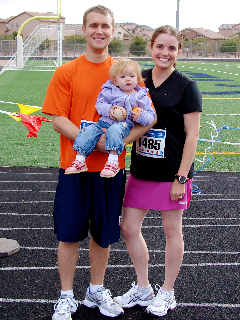 We already have our next race planned out (January ’08! )…and this time we invited some friends to join us. Hooray for 5K’s, for fitness, for friends, and for fun on the trails! SkirtSport’s GymGirl – I LOVE my running skirt! It’s comfortable, cute, and made of the best material. Nike FitDry Shirt – Sorry, I can’t find a photo, but this shirt is a definite winner. It’s lightweight and has a longer-than-normal length, which I appreciate. Plus, it was only $20 from Sports Authority! 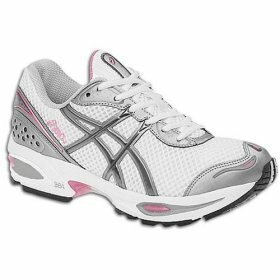 ASICS Women’s GEL-Cumulus VIII – These shoes are cushy enough to make any race more comfortable. Enell Sports Bra – Oprah loves these bras. I love these bras. Read my full review here. Great work! I always admire the discipline of runners. I exercise regularly, but I just can’t take running. Good for you! Thanks for visiting my blog! I am so impressed! Wow! I am not a runner, but I would love to run in a skirt like that, too! You’re awesome! Good for you. Running is addictive. I’ve run several 5k’s and this past October I ran my first half marathon. I don’t consider myself an athelete but as a mom my running time is valuable because it is also “me” time. I’m fairly new to blogging but I did write a post about my half marathon if you are interested. You are fortunate to live somewhere warm. I’m in MI and there is snow on the ground…makes it hard to keep up running in the winter. Congrats on your first race!! That is awesome and I agree be VERY proud of what you accomplished. Congratulations, Stephanie!! Be very proud of yourself! Congrats on your first race! I have no intention of ever torturing myself like that, but you go, girl! Check out the book Run Less, Run Faster for improving speed on 5km. I’m going to use it next year to train for a 10km.